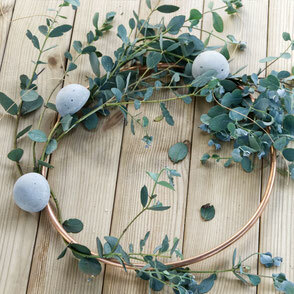 Traditional, a round summer wreath, don't you think?, yet fresh and different - well, thank you gorgeous!!! I was hoping you would think that, I was aiming for something familiar yet with a modern minimal maybe even edgy twist. 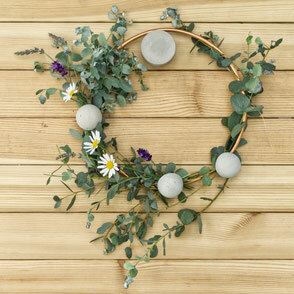 But it was important too that not much is needed to quickly create this contemporary wreath, for example for an event. The base is created with a wreath ring, or if you like, you do it like me and use a bit of copper coil. Little tip, before bending it to a loop thread the coil so you can pull together even further after bending it over a round object like a pot or so. Choose the size to your liking, mine is about 25cm in diameter. 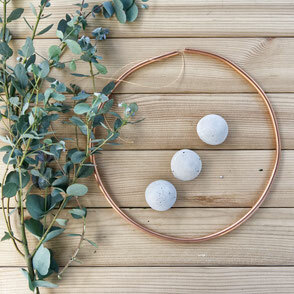 The second component is a bit of eucalyptus and third is a set of 3 half moon pendants. 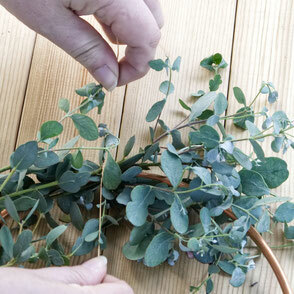 I use a bit of string to firstly add some eucalyptus but any other greenery you fancy will do. I fix it at three points around the loop. That is enough since the concrete ornaments will be fixed around the wreath loop as well. I choose to fix the 'Half Moon' pendants front facing, which means for this design it doesn't matter if you went for silver or gold loops on the pendants themselves. I choose three spots to attach the pendants and have to admit that it looked better when placed not too symmetrical. The attachment should be fairly tight keep them facing the way you want them too. 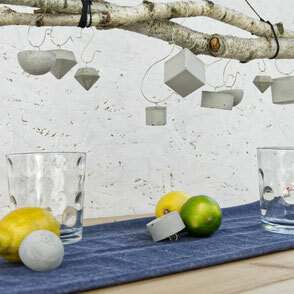 It is always a good idea to lift it up and check if the ornaments and greens stay in the places as you hoped they would once you are happy with the look. Well, if you like and wish to go really minimal you could just leave it like that. Or you could go on and add some bright spots. I went for some Lavender and Daisies. 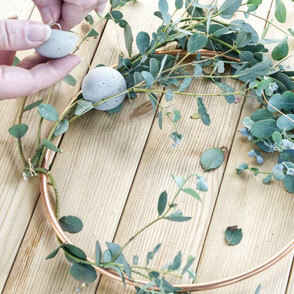 The trick is to leave the wreath hanging in its place and to reuse the ornament loops for the added plants. Simply put them through the loop. What else could you incorporate?! 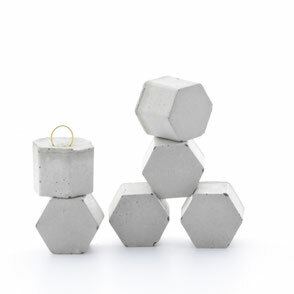 Well, for one you could use Air Plants, wires, dried flowers and leaves, grass or reed for a beach vibe or perhaps other geometric concrete ornaments. I hope this DiY is an inspiration to you and of course, I would love to see your wreath designs! 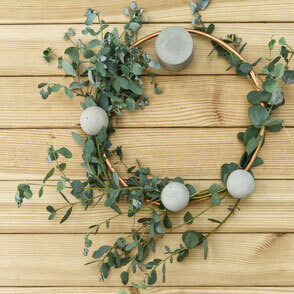 And just in case you have missed the last wreath diy click here for instructions to a triangular design.